Whenever I hear Erwin McManus preach, I am encouraged and challenged. Whenever I read Eugene Peterson I am reminded of the value of intentionally loving and serving the community that Jesus has called me to. When I listen to the Seth Godin “Akimbo” podcast I think about leadership and communication in new ways. I’ve never met these three men. In all likelihood, I will probably never meet them, but it’s important to recognize the role that these kinds of mentors have in our lives. You never know when a MYNM might become a Mentor You Have Met. I am in the doctoral program at Portland Seminary because I reached out to Len Sweet. I asked him if the topic I was interested in would fit in the program that he leads. His response was simple, “What are you waiting for? We need this!” Over the last two years I have been interacting with Len and a great co-hort of fellow learners. Len was a writer that I began following when I was studying at Northwest University. Somewhere along the line I found his email address. I had no reason to email him for years. I was content to have him as a mentor that I never met. But at just the right time, I reached out and I was surprised by his receptivity. Mentors You’ve Never Met may never know the impact that they’ve had in your life. I have found that it is helpful to think about who those people may be in my life. So who are your MYNM? Where is this peace on earth I hear so much about? Yesterday we talked about the peace that Jesus makes available for all mankind. 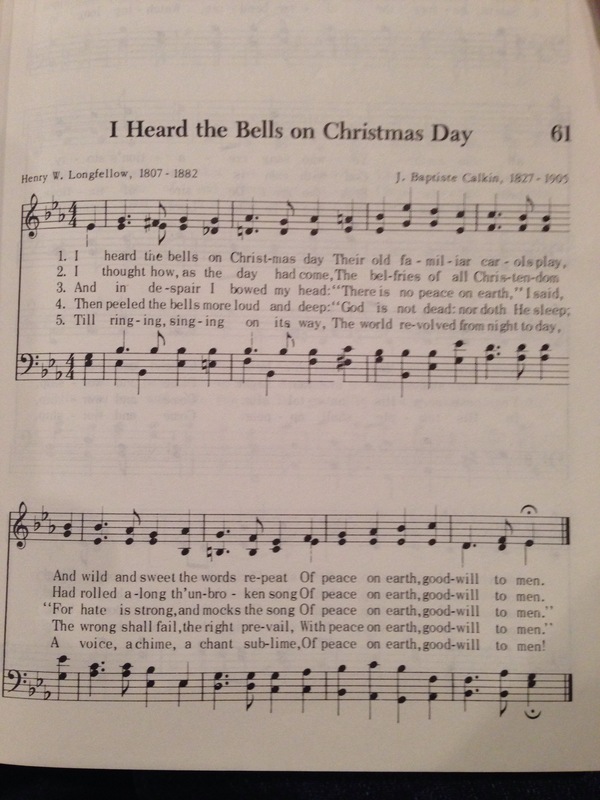 In our Softer Sunday service we sang this classic Christmas hymn. And as we were singing I was struck by the despair in the third verse. This song was written during the American Civil War. A time when the nation was being torn apart by many factors. Perhaps the most widely known factor was the American South’s insistence on maintaining their right to own slaves. Black lives were seen as less than white people’s lives. This song was written 150 years ago. It breaks my heart that our country is still going through so much turmoil and pain around race relations. It is just sad. And my white brothers and sisters. We don’t have to understand the pain the black community is feeling right now to still acknowledge that their pain is real. And their pain should be our pain. I heard someone quote Martin Luther King Jr. And the quote has really struck me. The news tends to highlight the riots but the truth is people have been quietly and respectfully protesting the events in Ferguson and New York. When these respectful protests go unheard, this pain escalates. Also frustrating, is that I feel like I can’t do anything to help. But that’s not true. I can hear the cries of the hurting and broken around me and try to be a peacemaker. That’s what Jesus challenged his disciples to do in Matthew 5:9. There is incredible pain all around us. My prayer is that the church will be their to mourn with those who mourn, pursue peace and reconciliation between people and God. And all the while keep praying and hoping for the day when Jesus will finally set all things right. When there will be true peace on earth. Christmas is a time that reminds us that while we have not fully seen peace on earth. There is a day when we will truly see peace. And it’s only ultimately possible through the work of Jesus, as he makes peace between humanity and God available, and his followers get to share that peace with the world. I fell into a Facebook debate the other day. I don’t know how it happened, it just did. Anyway, the debate revolved around poverty and being a Christian. At one point someone said, “Poverty is a horrible testimony.” This statement floored me because it seems to mean that Jesus who didn’t seem to have a ton of cash on hand (Matt 17:24-27), or a house (Matt 8:20), or a family, and didn’t leave any kind of financial inheritance then would have a horrible testimony. People in favor of “claiming” and “walking in” the blessing of Abraham are nice people. The problem I see however with this idea that Christians shouldn’t be poor is that it would put Jesus as well as most Christians in the developing world in the camp of having a bad testimony. It would put most of the early church in a the category of a horrible testimony, as they faced persecution, losing jobs and their lives, for their faith. This idea that poverty is in some way evidence of not having a good testimony is troubling. Also, as a side note, for Christians, our testimony is all tied to whether or not we said yes to the grace of Jesus which was extended to us. Rich or poor that’s the greatest testimony you can have. But back to the matter at hand. Someone could follow Jesus with all their heart, lead many people to faith in Christ, and they may never have “finanicial victory.” Would that person be a bad representation of Jesus to the world? Of course not. Someone could lose everything through no fault of their own, but still be a committed follower of Jesus and, they may work dilligently to get their finances back on track but to no avail. Does that person have a bad testimony? No. Jesus wants his disciples to be like him. Which means we must live lives that honor God. Rich or poor, every Christians should strive to be like Jesus. So let’s actually look at what Jesus said about poverty and wealth. What did Jesus say about the poor? This woman, who has no name in scripture trusted God, gave all she had. Now, is this Jesus saying to everyone, “Give everything and be blessed? Be poor!” No, but he is also not saying, “This poor woman has a horrible testimony.” He calls her blessed, because she didn’t just give what she could. She was generous in her worship of God through giving. The Bible doesn’t say then she went out and won the lottery. But I bet the next week she had another pair of small copper coins. She was poor, trusted God, and Jesus said she gave more than the rich. Jesus had more of a concern that his followers would desire to be rich. What did Jesus say about wealth? Jesus is clearly telling his followers to focus their heart on God and not on money. You can’t seek God and seek a so called “promise” that you will be rich. Jesus’ story here is about somebody who put his confidence in the riches he had produced through his fields. He then turned his focus on taking it easy, trusting in what he has earned, thinking that everything was set. But his wealth wouldn’t keep him alive forever. He died rich and a fool. Here is a rich man who couldn’t follow Jesus’s command to sell everything. His hope and security was in his riches and his possessions. His hope and confidence were not in God. He wanted God’s blessing but didn’t want to actually trust God. Jesus was calling him to a life of poverty and obedience. But he couldn’t handle it. Does Jesus call everyone to poverty? No. But he does call everyone to put their hope, trust and confidence in him. Because the only way we are going to be saved, is through faith in Jesus. Should poverty be glorified by Christians? No, that’s ridiculous. But poverty should not be shunned. Jesus’ words are pretty clear that focusing on money (rich or poor) instead of the things of God is a path to destruction. Has God’s face ever been on a coin? We are the coin that bears the living likeness of God. Giving if ourselves with whatever that may include, is the only legal currency of the kingdom of heaven. They say money makes the world go ’round. And it is true that our economies drive much of our culture and innovation. If there is money to be made then someone will find a way to make it happen. In doing so they move the world forward. The economy if God’s kingdom does not require money. God doesn’t need our money he wants our hearts. And if we surrender our whole heart to God, to be used by him to move his kingdom forward then we truly are the currency of God. Just like a coin has an image (Caesar, Kings and Queens, presidents) we bear the image of God. Who decides how to use your money? You do. If you are God’s money will submit to his plan? What if we actually lived like we were the currency of God’s Kingdom?